With a cameo of J. Omer Noury, designer of the aircraft. 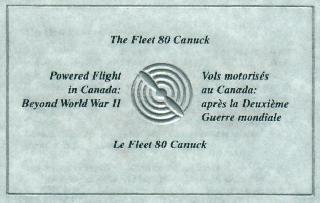 The coin features the Fleet Canuck C-FEAI flying over the National Aviation Museum in Ottawa. A sister-ship, CF-EBE, is part of the museum collection. 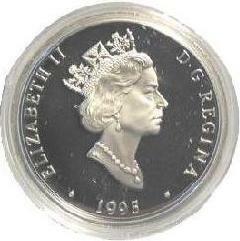 The Cameo portrays a likeness of J. Omer (Bob) Noury. The Fleet 80 Canuck is the realization of Bob's dream to build a light aircraft for the Canadian market. 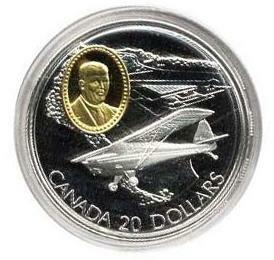 Robert W. Bradford C.M., an internationally recognized aviation artist, created the design for this coin. (iv) the design of the reverse impression of which shall depict a de Havilland Canada DHC-1 Chipmunk aircraft in a climbing position and, in the upper left quadrant, a cameo of W/C Russel Bannock, chief test pilot of de Havilland Aircraft of Canada Ltd., with buildings and landscape appearing in the background, and with the initials "RWB" appearing below and to the left and the words "CANADA 20 DOLLARS" at the bottom of the design. Governor General and Commander-in-Chief of Canada. hundred and ninety-five and in the forty-fourth year of Our Reign. Disclaimer: The document is not the official versions. eight coins of a final total of ten have been released in Part II.